Migraines would be the 3rd commonest ailment presented to the clinic on a daily basis, and with 11years experience after excluding pathology from the GP, our highly experienced Chiropractors know the next likely area of pain transmission is from the cervical spine (neck). Quite simply put the nerves of the neck are compressed by misalignments in the spine causing a local irritation and local inflammation to the nerve thus causing the migraine. The principal Chiropractor Mr George Prorellis's approach is through the use of either manual or non manual techniques to alleviate pressure on the nerve which is responsible for the symptoms this process occurs over a course of 6-10 visits according to the chronicity and the nature of the patients symptoms. 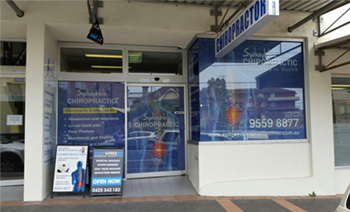 Our Chiropractors do not use forcefull techniques that are likely to jeopardise or cause a hightening or replapse of a patients symptoms, if you have not yet found treatment for your symptoms we encourage you to call our clinic 02 9559 8877for marrickville or 02 9529 4008 for sans souci today. Massage or physiotherapy is included in every treatment which lasts 30mins.